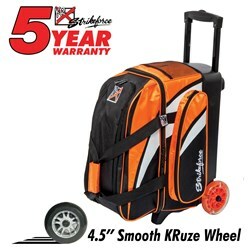 The KR Cruiser Smooth Double Roller Orange/White/Black has multiple features to provide the bowler. Its 4.5" wheels ensure a quiet and smooth roll, and it features a separate shoe compartment that can hold 2 pairs of shoes. Wow! Got a 2 ball bag this time just so I can haul all the extra junk I think I need while bowling. I highly recomend this product. I had a third ball velcroed on handle and it accidently slipped from my fingers while pulling it on floor, and bent one side of sliding bars. Now, It will not slide in and out without force, even tho I straightened bar as best I could. Haven't seen replaceable handles and bag can't be disassembled. Otherwise it was a smooth and great product with sufficient storage for my needs. Due to the time it takes to produce the KR Strikeforce Cruiser Smooth Double Roller Orange/White/Black ball it will ship in immediately. We cannot ship this ball outside the United States.